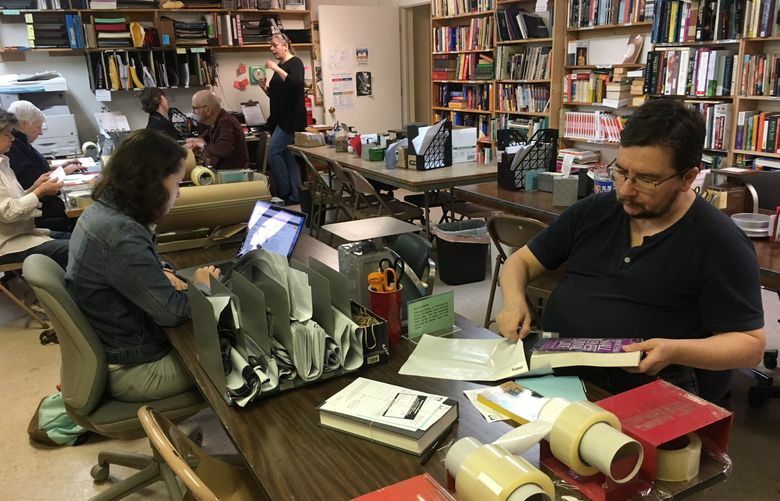 OLYMPIA — Last week, corrections officials faced a backlash after banning nonprofit groups from mailing used books to prisoners. This week, their math is raising eyebrows. In defending the ban, the Washington Department of Corrections (DOC) said last week it was a necessary step to tamp down on contraband that ended up in inmates’ hands. The agency cited a rise in illegal items, including 17 instances last year in which contraband was reportedly found in books. But information on those 17 separate instances, provided this week by DOC at the request of The Seattle Times, tells a different story. A dozen of those instances didn’t actually involve books at all. Another case involved a shank apparently discovered on a bookshelf at the Washington Corrections Center in Shelton, Mason County. An offender found it — and then reported it to an officer. The information on three of the four remaining instances involving contraband detail suspected drugs that were discovered in books. While narrative accounts of those incidents provided by the DOC indicate inmates holding contraband inside the books, none say whether the items in question had entered the prisons inside the books. Last Friday, after a week of uproar over the ban, DOC Secretary Stephen Sinclair announced the agency would make sure used books could still enter prisons in some fashion. Sinclair is expected to attend a meeting this week between the agency and the Seattle nonprofit group Books to Prisoners to discuss how to do that, according to DOC spokesman Jeremy Barclay. “At the end of the day, the secretary is interested in being involved in a way that maintains our relationship with external books donors,” Barclay said Friday. “The sooner the better, of course, so that we can get this back on the right path,” Barclay added, saying that more than one meeting may be held. For decades, nonprofit groups like Books to Prisoners have sent used publications to prisoners who write them requesting titles or types of reading materials. The ban would have largely left prisoners with only one alternative to receive books, through the Washington State Library’s Institutional Library Services program, which stocks the prison libraries. That program does not have new anticipated funding or a plan to make up for the books that would have been lost under the ban. According to a mid-March memo explaining the ban, prison mailrooms didn’t have the resources to screen books entering facilities for contraband. In May at Monroe Correctional Complex, officers discovered “a small clear plastic bag with black powdery substance” that they believed to be heroin in an offender’s book. In September at Coyote Ridge Corrections Center, an officer discovered what was believed to be a strip of an opioid known as Suboxone, which can be used to treat drug addiction, within a book. It was found after an offender asked to exchange the book with his cousin in a different cell. In December at Monroe Correctional Complex, a guard monitoring cameras spotted an offender placing something into a book box, with another offender then retrieving a book. Corrections officers discovered what they believed was marijuana and match heads in a bag inside that book. In a fourth instance, an offender was found in a dayroom with contraband, including Suboxone, pornographic photos and a tattoo gun. It was unclear whether any of those items were hidden inside a book he also had with him, according to the account. The information did not provide the titles of the books in question. The other dozen cases cited by the DOC came from a database search of incidents using keywords like “books” and “contraband,” said Barclay. That search returned 12 instances that contained those words, according to Barclay — but didn’t actually involve books. One of those involved an inmate “‘book’ed for being found with contraband,” he said.